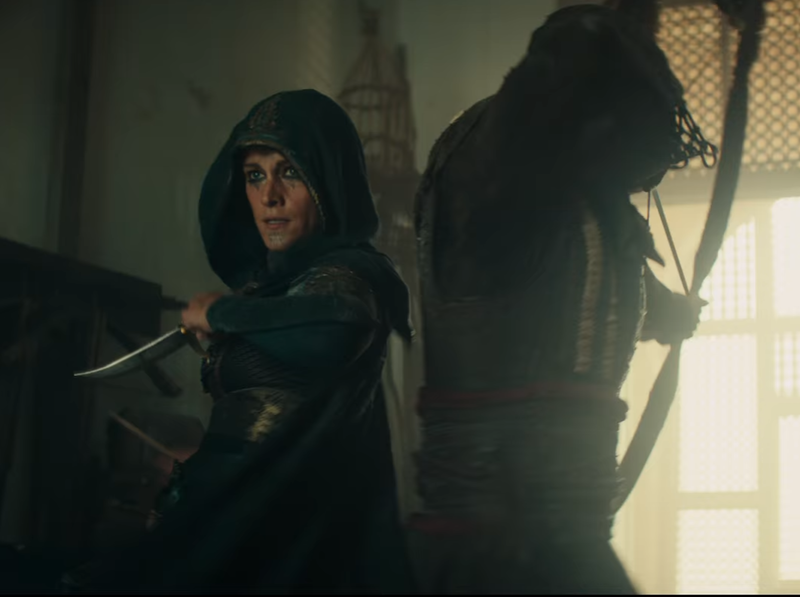 Assassin's Creed Movie: Trailer 2 Breakdown. In this article, we look at the bits you may have missed in the new AC Movie Trailer. Abstergo Pin: Alan Rikkin is wearing an Abstergo Pin. Abstergo Guards using Batons: The scene where Cal takes on the Abstergo Guards reminded me of AC2, where Desmond and Lucy are in a similar situation. The guards use Batons to immobilise. The first weapon is the Star, used by Maria. This weapon was on display at Gamescom. The second weapons are Edward Kenway's Flintlock Pistols, from AC4. The third items on display are bombs, similar to those used by Ezio Auditore in Assassin's Creed Revelations. The fourth weapon on display is Jacob Frye's Cane Sword. The cane itself is missing, but the Eagle blade remains. Assassin initiation: This part of the trailer looks like an Assassin initiation ceremony. Could it be for Aguilar? Other subjects: When Cal is running around the Abstergo facility, you can see the other subjects watching him. Return of Lin: Lin is another subject being held by Abstergo. Could Lin be a descendant of Shao Jun? Return of Moussa: Moussa is another subject being held by Abstergo. Games Radar previously revealed that he is the descendant of Baptiste, seen in Assassin's Creed Liberation. 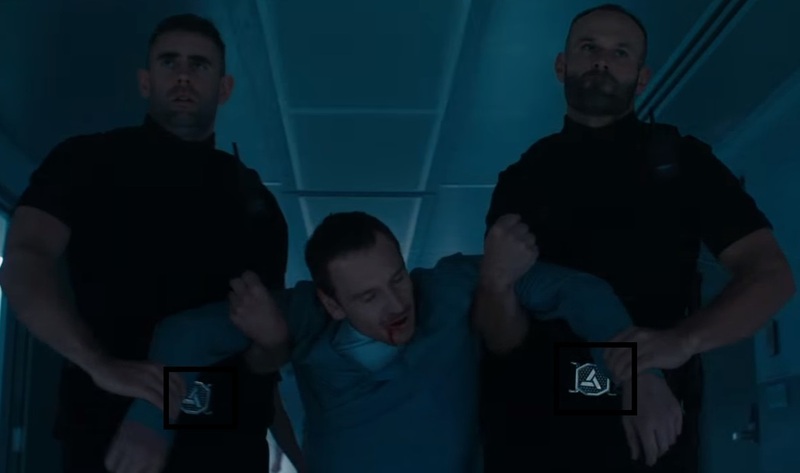 Abstergo Belts: All the Security Guards are wearing Abstergo Belts. 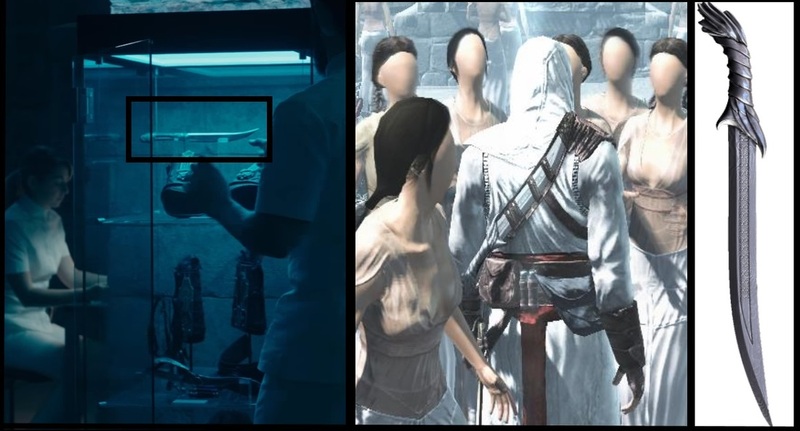 Altair's Short Blade: If you watch the trailer in slow motion, and stop it at exactly 56 seconds, you can see a short blade that looks very similar to the one used by Altair in AC1. Could it be Altair's Short Blade? AC2 Animus: At 1 minute and 4 seconds into the trailer, you can clearly see the Animus from AC2 behind Sophia! Animus chord: We finally saw the Animus chord clip into Callum's neck. Looks painful! It also explains the marks on his neck we previously saw. Aguilar's Finger: We can clearly see that Aguilar is missing a finger on his right hand. Other images from the film show him with all 5 on his right hand. This means that a finger has been removed in an Assassin initiation ceremony at some point in the film. It also means that the poster showing Aguilar syncing a vantage point is wrong, as it shows him with four fingers on his left hand. 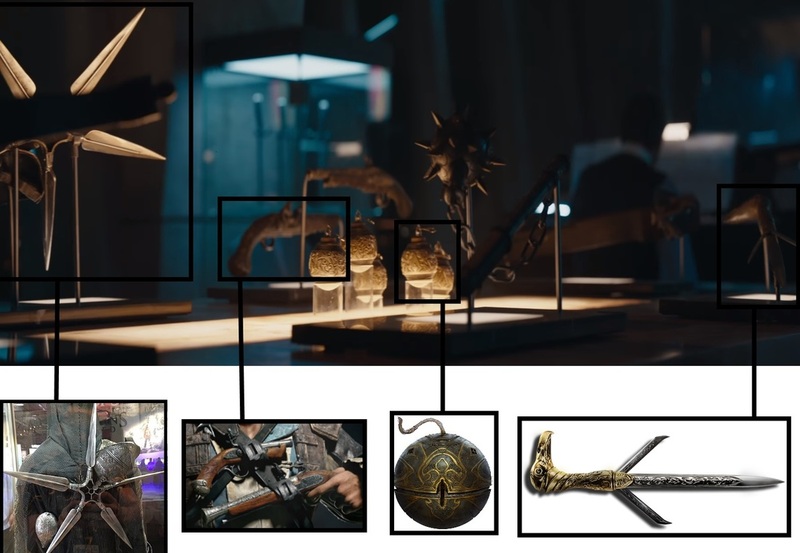 Rope Launcher: Aguilar has a device hidden inside his gauntlet that looks very similar to the rope launcher used in Assassin's Creed Syndicate. What could it be? New Assassin: The Trailer introduced a new Assassin. Could he be a member of the Spanish Brotherhood? Throwing Knives: The Trailer showed us Maria using throwing knives several times. She's pretty accurate with them! Moussa uses smoke bombs: Blink and you'll miss it! Watch the trailer in slow motion at exactly 2 minutes in, and you'll see Moussa using smoke bombs on the guards. Likely the start of the prison break that occurs later. 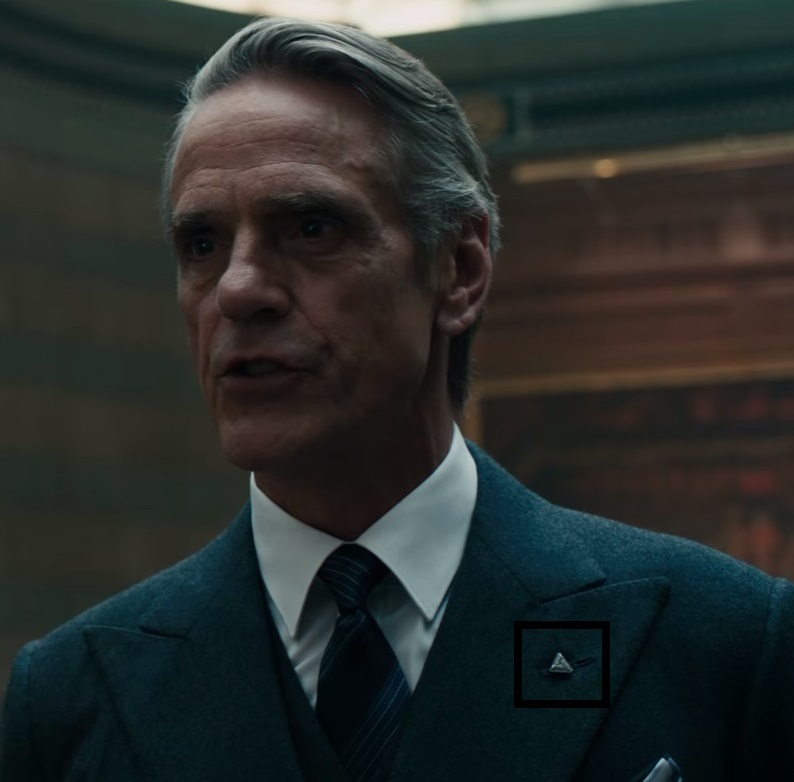 Assassin Insignia: At the very end of the trailer, Cal and Sophia are talking. Behind Sophia you can see the Assassin Insignia on the wall. Did you spot anything we missed? Let us know!